Preheat oven to 400º. Line baking sheet with foil, spray with cooking spray. Place all ingredients *except olive oil* in large bowl, mix until ingredients are well incorporated. Make meatballs using a regular size ice cream scoop. Scoop, mold into balls, and place on prepared pan. Place olive oil in a small bowl. 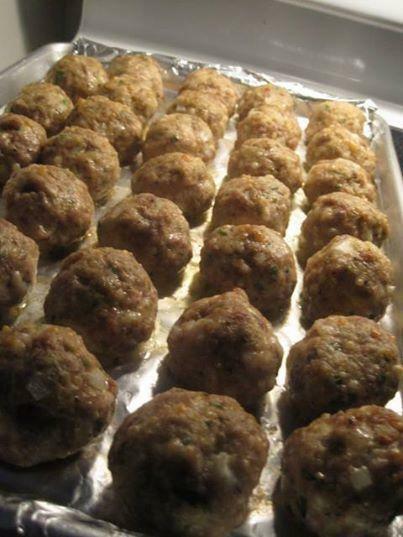 Rub palms with oil and begin coating each meatball until all have been coated with a small amount of the oil. Place in the oven and bake for 15-20 minutes. Serve meatballs with your favorite sauce. Great for meatball hoagies as well, or make smaller meatballs to serve as appetizers.